Late on Wednesday afternoon US President-elect Donald Trump had a phone call with Pakistan's Prime Minister Nawaz Sharif. According to a Pakistani account of what should probably have been a procedural discussion, Mr Trump lavished extravagant praise upon Pakistan's prime minister and its people. "You have a very good reputation. You are a terrific guy," it goes. In addition, Pakistan is "a fantastic country, fantastic place" with the most "intelligent" people and "your country is amazing with tremendous opportunities". Not satisfied with that, the account, commonly known as read-outs, culminates with this flourish: "Please convey to the Pakistani people that they are amazing and all Pakistanis I have known are exceptional people, said Mr Donald Trump." It is unclear to what extent these are direct quotes, but there was much bemusement both in mainstream and social media. Hours later, the Trump team released a statement which, if brief, emphasised the pleasantries generally found in these exchanges. Describing it as a "productive conversation", the two discussed how they would achieve "a strong working relationship in the future", the US-statement said. "President-elect Trump also noted that he is looking forward to a lasting and strong personal relationship with Prime Minister Sharif." But the effusive praise detailed by the Pakistanis did not go unnoticed. Many pointed out that India may have something to say about the president-elect's apparent delight at the invitation to visit Pakistan - "a fantastic country, fantastic place, of fantastic people" - when no US president has been since 2006 and there is a delicate diplomatic tightrope to be negotiated. It it not yet clear if Delhi has any view at all. Following a number of cross-border attacks, relations between the neighbours are at their lowest point in years. And the tone of the exchange certainly contradicts a Trump view in 2011. Image caption Donald Trump tweets: "Get it straight: Pakistan is not our friend..."
But while Mr Trump was criticised by some as naive for being fulsome in his praise of the leader of a country that has been accused of backing militants, many more just saw the funny side. The two did not apparently discuss Mr Trump's campaign promise to enact a "total and complete" shutdown of Muslims coming to America, later downgraded to "extreme vetting". The overwhelming majority of Pakistanis, including the prime minister, are Muslim. For now, the two former businessmen stuck to warm words. And just in case there was any doubt: "All Pakistanis I have known are exceptional people," was Mr Trump's view in the words of Pakistan. What will Trump mean for South East Asia? 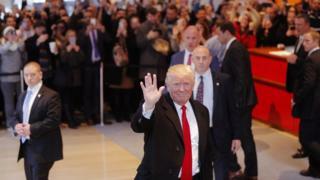 US election: Will Donald Trump's outreach to Hindus work?